This mystery bridge article takes us back to western Saxony and a village northeast of Glauchau called Waldenburg. With a population of close to 5,000 inhabitants, the town is located on the western bank of the Zwickauer Mulde, has a beautiful castle and historic city center, as well as an international European School. A link to the city’s homepage will show you what the town looks like and some of the things you can do there. Note: This is both a mystery bridge as well as a mystery infrastructure, hence its post in sister column, The Flensburg Files. New Photo Apps and other changes to make the online column more attractive. Pin-interest: As part of the plan to replace the flickr photo app, the Pin-interest app will features photos and some information on the bridges the author has visited, linking it back to either this page or the wordpress version. It had been introduced in 2015 but had been seldomly used up until most recently. Having been relaunched, the app will continue its function as before, but will provide the most basic facts for readers to look at. Most of these bridges pinned here will be the ones in the United States and Canada. Instagram: The Chronicles is the first historic-bridge-related website to have an Instagram app for photos. The purpose is to transfer the photos of the bridges taken by the author directly onto the website. It’s basically following the same method as its colleague in Vermont, Preservation in Pink, but more focused on historic bridges, mostly in Europe and elsewhere, where the author resides (in Germany). Both apps (located under the category Social Network on the left side) will effectively replace the flickr app, for security issues with Yahoo combined with its recent merger have resulted in the author abandoning the app, even though the bridges there will remain on there until further notice. Google Translate: Readers will now have an opportunity to read about bridges in their own language. The reason behind this is the number of request by readers in Europe to have the texts translated into their own language, including German as many international bridges profiled have originated from Germany. To access the app, scroll down and you will find it on the right hand side. Planned Events: Open to all pontists, historians and others, planned events can provide readers with information on upcoming events dealing with historic bridges, preservation, and other seminars dealing with history. If you would like your event to be posted, please contact Jason Smith at the Chronicles at flensburg.bridgehunter.av@googlemail.com. Planned events are open for everyone both inside and outside the US. Tour Guide/Lost Bridges: The Tour Guide page has been updated, including the ones produced by the author as well as the top two finishers of the Ammann Awards for the category Tour Guide as well as winners of the Author’s Choice Awards. The plan is to include more tour guides based on contributions by the author and guest writers, but also based on the results of the Ammann and Author’s Choice Awards from now on. If you have a city or region laden with historic bridges that you wish to write about, please contact the Chronicles. There are a few touch-ups to be made, including fixing Clustrmaps, adding a couple more apps and updating the themes and other widgets. But the main purpose is to provide better coverage to readers wishing to follow up on the findings of historic bridges and read about the preservation policies that are being advanced. Nonetheless we intend to continue writing and photographing historic bridges, making them attractive for tourists and bringing them up to the attention of people that care about the structures and their significance in terms of history and design and would like to preserve them for generations to come. This article is in connection with the creation of the database for the Bridge Builder’s Directory in the Bridgehunter’s Chronicles’ wordpress page, which you can click here to view. Indiana, together with Minnesota, Ohio, Illinois, Pennsylvania and New York, were considered the big six in terms of steel construction and bridge building during the heyday of architectural and infrastructural expansion between 1880 and 1920. Steel mills were found between Minneapolis and Pittsburgh, including the metropolises of Chicago, Indianapolis, Canton and Cleveland. Several schools of bridge building existed, which churned out the finest bridge builders and businessmen in the field. 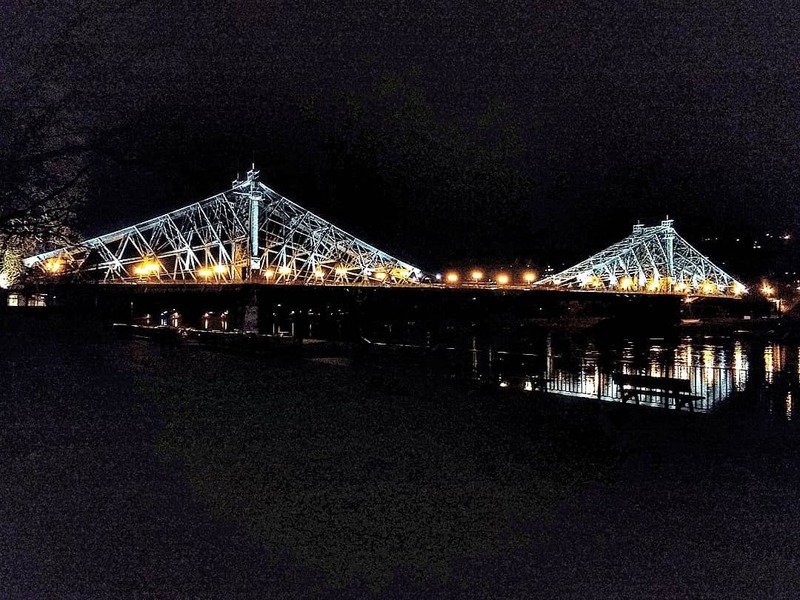 This included the Indiana school, which had over a dozen bridge builders, including the longest known bridge builder in the state, The Central States Bridge Company (CSBC). But what do we know about the company and its founder to date? Lefarge Bridge in Wisconsin: This bridge used to be the Hudson Toll Bridge until it was relocated in 1953 to its final destination. It was documented by HABS/HAER before it was removed in 1983. Little Flatrock Bridge in Indiana: Decatur County was CSBC’s primary customer as a half dozen of its bridges were built there between 1900 and 1916. This one had a fancy portal bracing, yet efforts to save the bridge from the wrecking ball failed, as the bridge was removed in 2000 after its replacement was built. However, the Applegate Bridge has a similar feature and is in storage, awaiting relocation for reuse. Boyd Bridge in Indiana: This used to span Sand Creek at CR 700 before it was relocated to Greensburg Park in Craig in 2006, nicely restored and now part of a bike path. Bernadotte Bridge in Illinois: This bridge features a Pratt through truss and a Pratt pony truss. Damaged by the flooding along the Spoon River, the pony truss span was taken out of the river and placed on blocks, while the through truss is still standing. Efforts are being undertaken to save the entire structure. Locust Street Bridge in New York: Located in the town of Waterloo, this 1914 arch structure was the only known bridge of its kind built by CSBC and is still in service today. Little is known what happened to the Central States except to say that even though the founder, Mr. Runyan, died in 1913, the business continued building bridges well into the 1970s and 80s, according to the Indiana Historical Society during the author’s correspondance in 2007. Whether the company still exists today, either as an independent entity or as part of a larger steel and/or bridge company remains unknown to date, nor do we have much information on the later structures built by CSBC. If you know more about the company, especially regarding Euguene Runyan’s life and the company’s existence sice 1919 in terms of bridge examples, advertising or other information, please contact Jason Smith at the Chronicles, under the following address: flensburg.bridgehunter.av@googlemail.com. Further information will be added to this page pending on the information that is received at that time.